Hi everyone, how’s it going?? Finally we are getting some spring like weather in town, in celebration of this I busted out this polish! Now I have said it quite a number of times, I love green nail polish but I don’t think it loves me back in return. However, that fuels my quest for my perfect green nail polish and this beauty comes really close! I picked this gem up in 2010 when it was the hottest shade at the time and while I was hesitant to wear ‘green’ polish at the time (even though I bought it based on trend)- I have rocked the socks outta this one through the years. 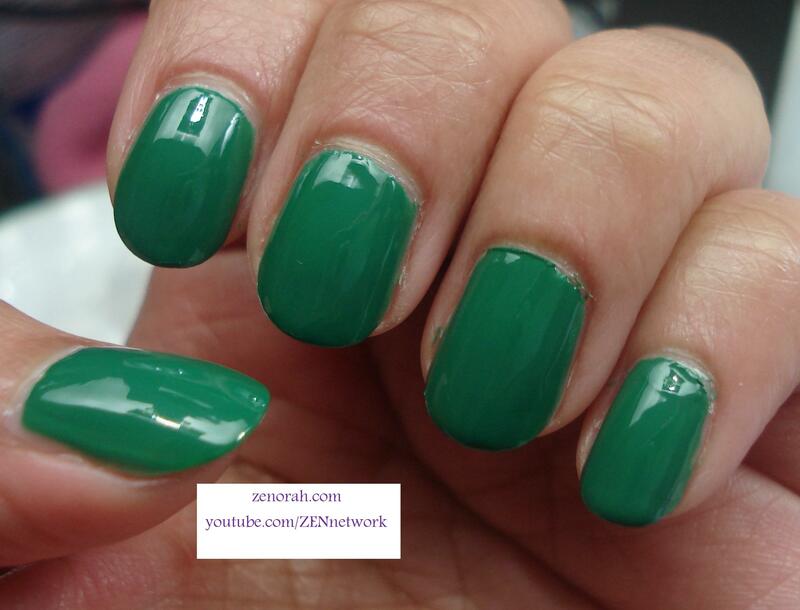 So if I can wear this green polish as much as I have and if you love green nail polish you WILL LOVE this one!!! 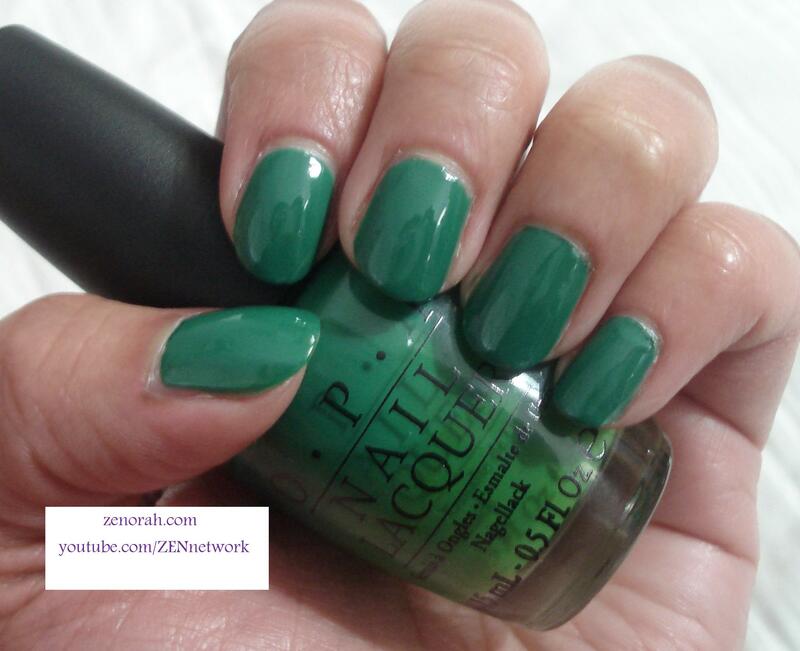 OPI Jade is The New Black – is a midtone grassy green semi jellly creme polish. This polish was released in OPI’s Hong Kong Spring 2010 Collection and it was all the rage back then. Seeing as Pantone’s Colour of the Year is Emerald, you NEED this in your life!! It was opaque on two coats and had a decent drying time. I typically wear it usually only in Spring or Fall but it’s a polish you can wear year round and I have always had people stop and ask me what I’m wearing because while it’s a simple shade it’s unique at the same time. The only thing that I can complain about is that the brush on this particular polish is a little wider than the usual OPI pro-wide brush – it could be….during that time OPI was switching over to their new pro-wide brushes and this was the first experimental batch. The reason why I bring this up is that it’s hard for me to polish my nails with really wide brushes because my nail beds are small. However, since 2010 I have noticed the pro-wide brush to be a decent size….But other than that – the polish itself is GORGEOUS!!! I like wearing this polish most when I’m wearing really colourful clothing and I want something that’s eye-catching but stylish. I know mint nail polish is this year’s spring trend but I encourage you to buy this shade because you’ll wear it A LOT more than you think!! Do you own OPI Jade is The New Black? What are your thoughts on this nail polish? I love this color…definitely a must have! I’ve been wanting to pick this up for a while, it’s so pretty!